Due to segregation in the 1920s, African Americans are not allowed to check out books from the library. Richard Wright discovers his passion which becomes a road to his freedom - books. 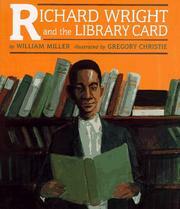 Miller, William, “Richard wright and the library card,” Children's Picture Book Database at Miami University, accessed April 20, 2019, https://dlp.lib.miamioh.edu/picturebook/items/show/6318.